Played collegiate baseball at Culver-Stockton College (NAIA) in Canton, MO and graduated with a BS in Business Administration. Graduated from Archbishop Molloy High School (1998) and played under legendary coach Jack Curran. Played two summers in the CICL with the Quincy Gems (’99,’00) where he played with three future, 1st Round picks. Modica still holds the single season Quincy Gem ERA record, 0.99 (’00). Signed as a free agent in the summer ’01 by the San Diego Padres. Played two seasons in Eugene, OR (Northwest League). 2003-2004 played with the River City Rascals of the independent Frontier League. Was named to the All-Star Team both seasons as well as Rascal Pitcher of the Year both seasons. Attended Spring Training with the Milwaukee Brewers in 2004. Finished the season with the Somerset Patriots (independent Atlantic League) managed by 1977 Cy Young Award winner Sparkey Lyle. He pitched there again in 2005, starting and winning Game 1 of the Atlantic League Championship Series. 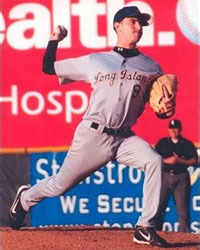 Pitched with the Road Warriors (Atlantic League) in 2006 before being traded to the Long Island Ducks. Career Stats: Record 33-26 4.14 ERA 493 IP 399 K’s. Currently coaching for the Midville Dodgers travel baseball club and Varsity Baseball Coach at Christ the King Regional High School.